This past Thursday, November 1st, Nintendo showed its first Wii U launch video produced for the United States. 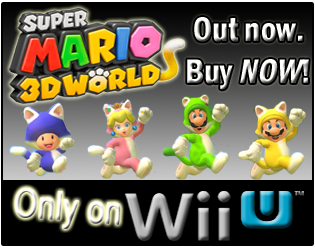 They released a New Super Mario Bros. U commercial and a SiNG Party commercial, both Wii U games, last week as well. The official launch video has received very mixed reactions. Some Nintendo fans think it's okay, and that it will do okay with multiple viewings. Others think it's pretty bad at conveying what the Wii U is and what the Wii U is about, and aren't fans of the music chosen for it. If you missed the new Wii U launch video an commercials last week for the U.S., brew yourself some coffee and hit the jump to see them below, as well as my updated version of the first official "Wii U Advertising Campaign Launch Video"! I personally don't think the "Wii U Advertising Campaign Launch Video" does a good enough job of showing that the Wii U is a brand new console, and not simply a new controller that can be used with existing Wii consoles. Same with the New Super Mario Bros. U and SiNG Party commercials. Every main shot of the Wii U console in the videos is hidden behind the Wii U GamePad, which I think might lead to confusion for many being that the black Wii console and black Wii U console (same for the white versions) look very similar in appearance. Also, it seems very "busy" to me, with nothing being explained as to what is happening and being shown. I don't think the background music is a good choice if the ad will be used to target all ages of potential Wii U buyers. (Bean 1 enjoys the video a good deal, and Mrs. Coffee didn't mind it, but she did know about the Wii U before watching it.) I do think the launch video would be better marketed at a younger audience, and not the "expanded audience" of older gamers that Nintendo picked up with the Wii and I think it will be interesting to see how/if Nintendo adapts the Wii U marketing strategy for different audiences. Being that the "Wii U Advertising Campaign Launch Video" doesn't say "Commercial" in its YouTube title though, like the two for the Wii U games do, makes me wonder if the ad will actually run on TV, or if it is perhaps just designed for the internet to kick things off? Even though I don't think the music is the best choice (and I lack the announcer voice), I decided to see if I could have some fun and re-edit the video using the same background music in the original, but make it a little bit more informative and help show viewers the Wii U is not just a new controller, the GamePad, but also an entire new system. You can see my updated, over caffeinated, version of the "Wii U Advertising Campaign Launch Video" below. 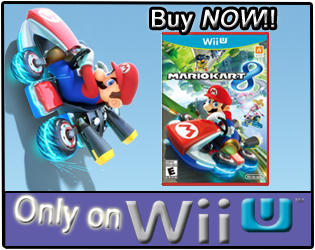 Are you impressed with Nintendo's Wii U launch video and commercials for the U.S. market so far? Do you think they need to provide more information in them, as I do? If so, what information would you like to see in a general Wii U console commercial? Would you prefer an official Wii U video that addresses and shows a little better what the Wii U GamePad is being used for, and that the Wii U console is entirely new; perhaps like my updated, over caffeinated, Wii U video? I'm not real impressed w/ the ads yet - I just feel like big N is only marginally answering some of my questions about it. I won't wind up being a release buyer of the Wii - I'll definitely see how it tracks and works over the first several months. I like the new layout btw. "I won't wind up being a release buyer..."
On the layout, I was able to harass this guy over the weekend, and get info and read lots of stuff on the HTML coding...must have been between some Madden games. Does it display like the image attached on your monitor by any chance? If Nintendo could see this they could take it and make it look a bit more professional and I'm fairly certain it'd sell more units than the current batch of ads. I have a slightly updated version in the works, for another post. Well you did great with the editing. I mainly just mean the writing on the gamepad such as 'scan things', I guess you could do that yourself though. I'm looking forward to seeing the updated version. I could do without the music and windows8-esque colored cubes, but it's ok. If you aren't buying a Wii U day one, the commercial is NOT OKAY! It should make you want to camp outside for the system, and take the entire next week off to play all the launch games available. So, are you buying a Wii U day one? lol, then I guess it falls short. I'm not going all Triforce style and camping out nor am buying day one. Lots of good looking stuff, but will probably wait a year or two. Have you missed the reports that we are on/over the FISCAL CLIFF!?! You are to blame. You, sitting at home, playing a LAST gen console and not upgrading day one. Not going out and spending money. Since when has saving money done anybody any good? As for going Triforce style, I have never waited all night for a console, just a few hours...though when the PS3 and Wii released, Mrs. Coffee and I did drive out of town that weekend to visit some friends, and we drove around their town during the night, and saw lines of people EVERYWHERE for the systems. It was rainy, and cold...and they had tents out at their Best Buy. I really am wondering how the lines will be for the Wii U.